It does and I fully expected the MSM to suppress the 9/11 grand jury story just like they suppress every story that might upset the official 9/11 narrative. That is just about the most ridiculous statement I have heard in a long time. Upsetting an official narrative has never bothered them in the past, especially a republican narrative. Steel is an excellent heat conductor, and the frames were a giant heat sink which wicked heat away from the impact zones. The plane hit damage was negligible to the towers which were 2,000 times an airliner’s weight, steel vs. aluminum. A fully loaded 767 weighs 200 tons. Each tower weighed 450,000 tons, one quarter of that the steel frame. Think of how much you can load up on a 50 pound barbell bar at the gym. Easily 500 pounds without bending, 10 times the weight of the bar. The average weight of an automobile is 2 tons. A baseball weighs about 5 oz. Yet a baseball hit against a car window will shatter it. How's your analogy using the weights of objects work now? NIST did not find any samples of steel which reached more than about 500F. I guess you just ruled out thermite/thermate eh? To the best of our knowledge, little was known about the effects of a fire from such an aircraft, and no designs were prepared for that circumstance. Indeed, at that time, no fireproofing systems were available to control the effects of such fires. A few floors falling would not suddenly crush everything beneath it without a lot of help. It was not "crushed". The connections between components were sheared by the falling debris. It was paint, not nanothermite. The official 9/11 narrative (a conspiracy THEORY created and promoted by the Bush administration and their puppets) has been accepted as fact by all political parties and that encompasses the entire US government. What's ridiculous is the above, YOU're the one who claimed the MSM is not covering the grand jury story and I agree so there is no controversy with that fact. The official 9/11 narrative is and has been used as a pretext for waging an endless war for the $$$benefit of the military industrial complex so there is a tremendous financial incentive to keep the narrative intact. Any opposition to or controversy about the 9/11 narrative has and is being demonized relentlessly by the MSM and the US government. 9/11 was the gift that keeps on giving. If you think the facts and history are "ridiculous" that's ok with me, I wouldn't want to shatter your world view, but that's just sheer denial of reality. JC: And yet, when I turn back to that article by Bažant and Verdure, they say that “because a significant amount of steel insulation was stripped” – (they make that claim) – “many structural steel members heated up to 600°C”. They then go on to say that “at 600°C” “about 85%” of the yield strength is lost. So they’re claiming that many structural steel members did in fact get up to that temperature. You are quite the level of stupid. Does that car then fall apart and disintegrate to the ground? If you think the facts and history are "ridiculous" that's ok with me, I wouldn't want to shatter your world view, but that's just sheer denial of reality. I am still looking for your "facts"
Facts don’t belong to anyone they’re just facts and they speak for themselves. “None are so blind as those who will not see"
Yes all metals are excellent heat conductors. The fact that some are better than others does not negate that, except maybe by your "logic." Correct, most the fuel was blown out in the fire balls on impact, and the rest burned of within 10 minutes. And yet the fires still burned for over an hour. How did that happen if the fuel was all gone? Maybe, just maybe, because the building that the 10,000 gallons of fuel exploded in was an office building full of office equipment, and most office equipment are made from either wood or oil based plastics which burn very hot? So your idea that because the jet fuel was burned off then the fires must not be severe is flawed. Office fires can burn very, very hot. Add to that the impact holes allowed massive amounts of oxygen to enter the fire and you have basically a giant furnace. Easily capable of 1000°C. That's why tall buildings are all made with steel. Buildings are not made of steel because of their fire resistance. If that was the case then why would they ever bother with spraying fire proofing on steel? And why would even the best fire proofing only have a rating of 2 hours? Tall buildings are made from steel because it makes them comparatively lite weight and rigid, meaning you can build significantly higher with maximum office space. But they also rely on fire proofing and sprinkler systems to protect against fires. Neither of these protection mechanisms were effective on 9/11, as none of the sprinklers were operating on the floors with fire on them in the towers and WTC7, and the fire proofing was blown off by the aircraft impacts in the towers, and in WTC7 the fires burned well beyond the fire proofing's two hour limit. A large fire might gut it, cause partial buckling in areas and partial collapse, but never total failure of a structure, and certainly not in seconds. That depends entire on how the structure is designed. It so happens that the unique design of both the towers and WTC7 made them particularly susceptible to fire induced thermal expansion, buckling, and failure. If the failure happens low enough with enough weight above it, then gravity will do the rest and the building can come down. We have several real world examples other than the WTC. We have the Plasco building in Iran, and we have a steel building in Sao Paulo which both collapsed to the ground in seconds due to fire. There are also examples prior to 9/11. A building called One Meridian Plaza was so heavily damaged by fire that the fire fighters pulled back fearing it would collapse. Thankfully the fire reached a floor which had an operable sprinkler system and it stop the fire from spreading further. Eventually it was extinguished however the damage to the steel structure from the fire was so severe that the building had to be dismantled. Beams were permanently warped, floors were sagging, and some parts had suffered local failures. Thankfully the structure of this building was such that the load was able to be redistributed to other steam columns however, as mentioned above, the design of the WTC towers and WTC7 made them more susceptible to collapse from fire than One Meridian Plaza. The fires were confined to the impact areas and already going out, as evidenced by the black smoke of cool, oxygen starved fires. Oh boy. That is an argument I have not seen in a long time. There are plenty of pictures taken prior to collapse which shows massive fires still raging in the towers. And black smoke does not mean the fire is cool, or oxygen starved. Have you never burned anything made of plastic before?? Firefighters inside were on the burning floors, and reported that the fires were almost out, which is what you would expect from fire retardant furniture and absent a forced oxygen supply like a strong wind. Nonsense, nonsense, and nonsense. As you said Orio Palmer made it to the 78th floor. The aircraft impacted mainly on the 80th to 82nd floor with only small amounts of fire and debris making it to the 78th floor. So he reported there were two pockets of fire on the 78th floor, makes sense considering the vast majority of the impact was several floors above the 78th floor. The idea that the furniture was "fire retardant" is not backed up by a single shred of credible evidence. And as already discussed, the holes which the aircraft made in the towers allowed plenty of oxygen to be constantly supplied to the fires like a giant furnace. The building was never made to resist a dynamic load falling on top of it. You're also treating the lower building like it's a solid mass. It is not. Most of this building was air. When the building above started collapsing, you're assuming the columns in the upper portion were landing square on the columns poking up from the lower sections. They were not. The lean of the south tower is evident enough that the top portion of that building was not landing square onto the columns below it, but was instead landing on the floors. As soon as the top sections started moving downwards, the kinetic energy being released was massive! of course steel beams are going to be flung out all over the place. I think you are severely underestimating the energy involved in this buildings collapse. No there was not. The paper by Harrit, Jones et al came to a conclusion they wanted rather than the conclusion their own data showed. No where in their paper did they show there was thermitic material in the dust. In fact even their own results show it was not thermite but they lied and said it was thermite anyway. The paper has been shredded to bits by people and in 2012 the JREF forum got WTC dusted previously used for an EPA study, submitted them to a science lab, who found the exact same red/gray chips Harrit found in his dust, and found that there was zero elemental aluminium in them and therefore could not be thermite. What they were, were chips of paint from the steel beams. Wrong. There are some reports of molten metal, however no pictures exist of this and the ones which the truth movement used have been shown to be edited with filters and colour edited to make it look like there is molten metal when actually it is not. But the fires in the ground burned very hot, being insulated by the debris this is not surprising, and it is also not surprising that with the amount of low melting point metals such as copper and aluminium around that there may be some molten metal, but to say it was molten steel is completely baseless and nothing more than speculation. But the most important factor here is that no controlled demolition has ever left molten metal behind. Even if thermite had been used in some unspecified way, thermite burns and then cools instantly. It doesn't stay molten for long, so even thermite does not explain the molten metal. What does explain it? The fact that the towers had massive and very hot fires burning in them, and when they collapsed into the sub-basements those massive and hot fires continued to burn insulated in the ground for weeks. Molten metal in the basement is a further support to collapse from fire, because no controlled demolition in history has ever left behind molten metal. and other parts of the story like an amateur pilot flew a circle dive around the Pentagon like a Chuck Yeager and nailed his target with plus or minus ten feet. Once you study the official account the real nutters are the ones who believe it. Ironically you seem to be the only one here who has not studied the official story at all. Instead what you appear to have done is believed what conspiracy theorists say is the 'official story' but not actually checked it for yourself. It is painfully evident by almost everything you wrote in your post that you have no idea what the official explanations are. What is worse, you seem to be repeating conspiracy theories that have been debunked for literally 15 years or more. It's like you're some 16 year old who only just discovered what 9/11 was from some online conspiracy theory videos like Loose Change or 9/11 Mysteries. Maybe you should step away from this forum and go look at some debunking material? On youtube there is a channel by RKOwnes4, who runs a series called 9/11 Debunked. They are mostly pretty good although even a couple of those have some errors but they are okay. I wish you luck. Honestly. It takes a long time to dig through all the conspiracy garbage surrounding 9/11. There are some reports of molten metal, however no pictures exist of this and the ones which the truth movement used have been shown to be edited with filters and colour edited to make it look like there is molten metal when actually it is not. But the fires in the ground burned very hot, being insulated by the debris this is not surprising, and it is also not surprising that with the amount of low melting point metals such as copper and aluminium around that there may be some molten metal, but to say it was molten steel is completely baseless and nothing more than speculation. What do you figure girders are made of? Copper or aluminum? X. CONCLUSION AND RELIEF REQUESTED. For all the reasons presented herein, The Lawyers’ Committee for 9/11 Inquiry, Inc. a non-profit organization dedicated to promoting transparency and accountability with regard to 9/11, and the co-signatories listed below including some 9/11 family members and survivors, hereby respectfully request, pursuant to the United States Constitution, and 18 U.S.C.§ 3332(a), that the United States Department of Justice present to a federal special grand jury, or in the alternative to a federal grand jury, the facts and evidence presented herein and in the accompanying exhibits concerning federal crimes committed within the Southern District of New York related to the September 11, 2001 attacks on the World Trade Center (WTC). We owe this to everyone who died because of the 9/11 attacks, and to everyone who survived, no matter where the evidence leads. The Lawyers’ Committee is willing to present this evidence directly to a special grand jury, or in the alternative to a grand jury, and the expert architects, engineers and scientists who will be submitting their declarations as a supplement to this Petition are also willing to testify directly to a special grand jury or grand jury. The undersigned respectfully request that the United States Attorney and the DOJ advise the Lawyers’ Committee within 30 days of their receipt of this First Amended Petition of the actions either or both intend to take on this First Amended Petition. In defense of the OCT you do have the opportunity to file an Amicus Curea brief explaining to the grand jury all you posted, preferably include how and why all the eyewitness claims are not valid and how your "expert" opinion invalidates those of all the named expert witnesses and you should also include your background/standing as a "superior expert witness" so your brief will not be ignored. No testing was done on what molten material some said they saw and therefore no one can say whether it was steel or other metal. The fires were not hot enough to melt steel so it's fairly easy to ascertain it was other metals such as copper and/or aluminium. It is impossible to know what burning object this grapple has. We don't even known if it's molten or just red hot. And as seen with the two examples above pictures of hot material can be misleading. But of course the overall thing to note here is that no controlled demolition in history has left behind molten metal. This fact does not support your conspiracy theory, it refutes it. It just goes to show that very hot fires in the towers became very hot fires in the rubble. You have presented way too much science here for many posters. I thank you for introducing it, but those who still don't realize they were deceived in 2001 are allergic to science and truth, and react accordingly, as you have seen. My only correction would be that steel is NOT an excellent conductor of heat. It is a poor conductor of heat, but that fact supports your argument that heat generated on the floors with fires could not possibly have been conducted throughout the building. Further, we know from Willy Rodriguez that an explosive event took place in the basement levels just moments BEFORE the airplane strike. No testing was done on what molten material some said they saw and therefore no one can say whether it was steel or other metal. Since girders are obviously made of STEEL, no testing would be required to determine if the girder Astaneh claims to have seen melted is steel. Furthermore, there are many eyewitness claims of seeing molten steel. Whether you agree with these eyewitnesses or not is irrelevant. All eyewitness claims, especially corroborating claims supported by other evidence, including PHYSICAL evidence must be thoroughly investigated and none of these were to my knowledge. 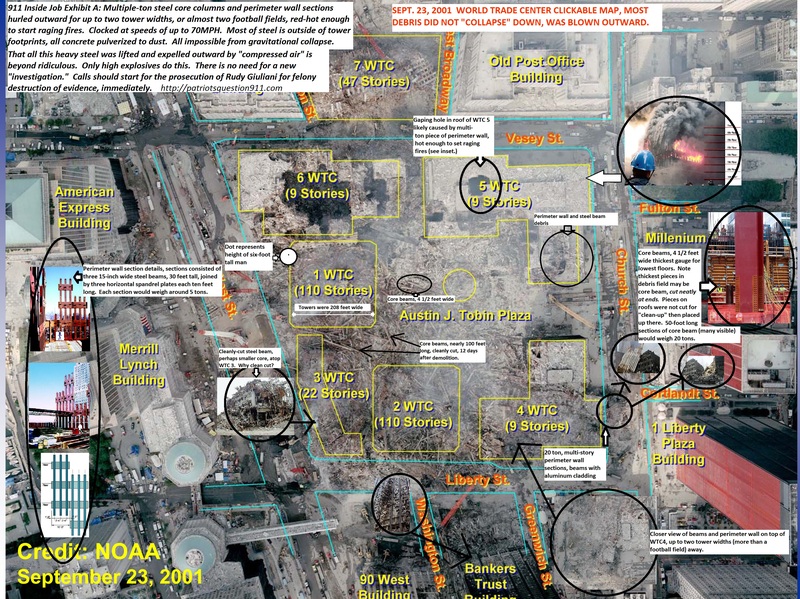 In fact, John Gross, lead NIST engineer tasked with investigating the "collapse" of the 3 WTC towers on 9/11 DENIED ever hearing of eyewitness molten steel claims. This is the very same "investigation" that claims to have interviewed many eyewitnesses. The fires were not hot enough to melt steel so it's fairly easy to ascertain it was other metals such as copper and/or aluminium. Yet as posted, there is NOT ONE eyewitness claim of seeing molten copper or aluminum or any other metal but STEEL. And girders are NOT made of copper or aluminum. But of course the overall thing to note here is that no controlled demolition in history has left behind molten metal. And no fire in history has left behind pools of molten steel either. So it's just one additional reason to fully investigate these corroborating claims of molten steel. This fact does not support your conspiracy theory, it refutes it. I don't have any conspiracy theory to refute. Eyewitness claims are EVIDENCE, not conspiracy theory. Nothing I posted is a conspiracy theory, just FACT (i.e. eyewitness claims). It just goes to show that very hot fires in the towers became very hot fires in the rubble. Fires are always very hot, that has nothing to do with eyewitness claims that were never investigated. You are attempting to bury the facts (eyewitness claims) with irrelevant denial nonsense. Aluminum burns and the towers had aluminum skin. Explain something to me Munkle. How is the weight of one object striking an object of another weight used to determine the amount of destruction? What you are saying is that nobody and construct something that weighs X and then hitting it with something that weighs LESS than X and have it completely bring down that structure. The towers stood after the impact right? If I throw a molotov cocktail through the window of a house and it burns down, are you going to say that molotov cocktail couldn't have brought the house down because it weighed less than the house? It is nearly impossible to melt iron except under very unique or controlled conditions and yet we have molten iron after the heat source is removed. It would very quickly solidify and yet we have pictures of it which would indicate that people were present at these extremely high temperatures. It simply does not tie together. Pictures or no pictures, the corroborating eyewitness claims supported by physical evidence are what they are and must be thoroughly investigated as this is a very unique anomaly. There is not one reason why NIST ignored these claims or that John Gross lied when he said he never heard of it. That's not only incorrect it's also irrelevant. Aluminum does not burn, it melts. And it has nothing to do with any eyewitness claims of seeing molten steel, especially not Astaneh's claim of seeing the "melting of girders". Again, there are NO eyewitness claims of seeing any other type of molten metal other than steel or iron. Again, there are NO eyewitness claims of seeing any other type of molten metal other than steel or iron.